If one talks about cheating in exams in India, the picture of people climbing school walls in Bihar while trying to help out children with chits comes to one’s mind. We usually come across people scaling the walls of the school and peeping into windows trying to help out the students with answers and ‘chits’. But it won’t be wrong to say that there are scores of students who manage to take a peek into their neighbour’s answer paper, or even smuggle in a couple of chits rolled up in their sleeves to help them out a little. Teachers and invigilators find it difficult to manage a class of over 40-50 students as it is not possible to look at all the students. So, to manage this situation and make sure that children don’t cheat in exams, this school in China has come up with an amazing new idea. 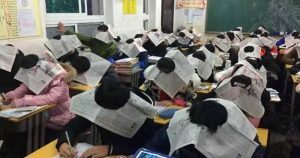 According to local Chinese media, it seems a school in the Anhui province of the country cut out skull-sized holes in newspaper sheets and had the students wear them over their heads. Yes, the students are made to wear newspaper ‘hats’ so that they could not peep at another’s exam answers. Not only did this restrict their eyes from wandering, but also prevented others from looking into their answer sheets. These photographs of the students in their headgear seriously sitting in class and writing their exam have gone viral on social media platforms, and the response has been mixed. While some have said it’s a clever idea, others have slammed the school saying it is insulting to the students since it makes them look ridiculous. Well, there is no doubt that the picture of these students wearing newspaper hats as an anti-cheating device will definitely make you chuckle! Imagine doing that in India! What do you think of this story? What would it be if the same is followed in India too? Let us know your views in the comments section below.